These cool pieces of circus history will be available to purchase at an estate sale in West Allis (part of Milwaukee), Wisconsin. Sale starts Monday, July 27, 2015. My parents, No Egrets Antiques & Estate Sales, are running this sale. More info and photos here and here. If you like circus memorabilia, don’t be a bozo and miss it! Featured here are a poster from The Great Circus Parade in Milwaukee, 1992; a photo signed by Bozo the clown (to “Joey”), and, the most unique, a check signed by the legendary Emmett Kelly. 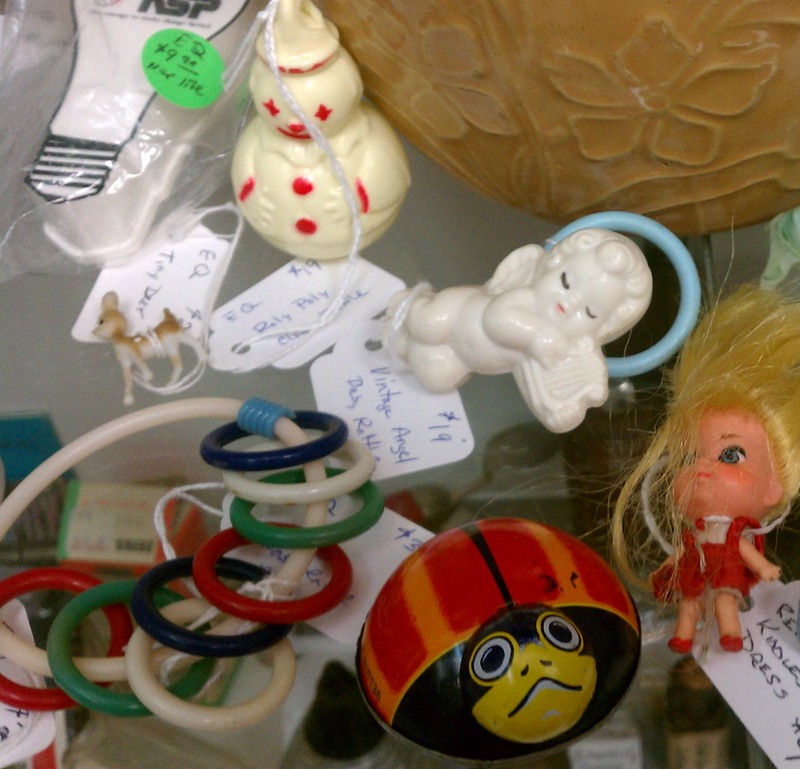 These are a few of the vintage baby rattles we have in the case at Exit 55 Antiques. Normally, I am afraid of clowns (one did try to assassinate me once — and that’s all it takes); but somehow a roly poly clown is not so scary. By the way, I also find the fact that such round-bottomed toys are called “roly poly” toys absolutely adorable! But it’s the celluloid (or other vintage thin plastic) angel which is my favorite. Isn’t that chubby little cherub sweet?! I don’t collect records by series or any other system, to be honest. Like everything else I collect, I mainly rely on the serendipity of stumbling into something and falling under it’s charm… Then, whether I buy it or not, the obsessive researching begins. So I didn’t know that the old Capitol Records series of Record-Readers were once sold as Looky Talky book and record sets. 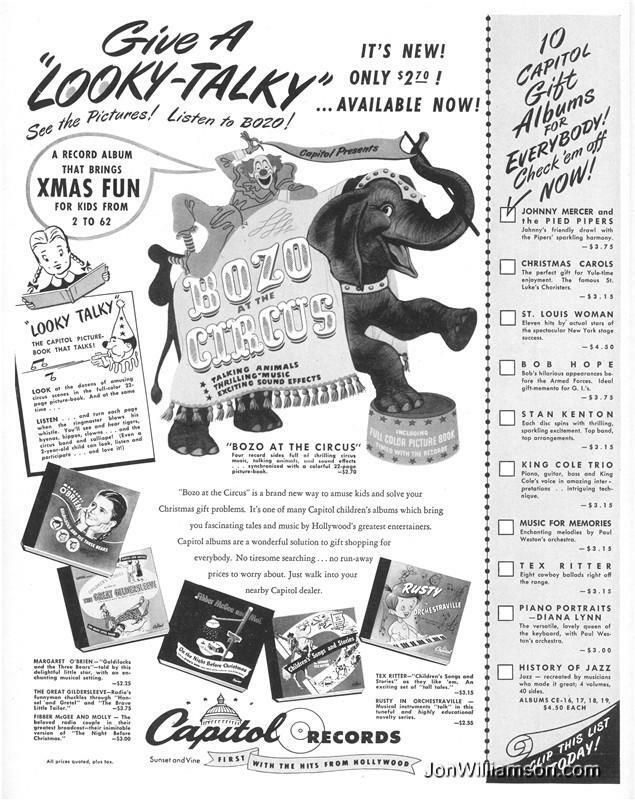 These set of records and books for children featured Bozo The Clown , Looney Tunes and Merrie Melodies characters, Disney and other famous characters of the day. The 1946 Capitol Records “Looky Talky” ad via Jon Williamson. 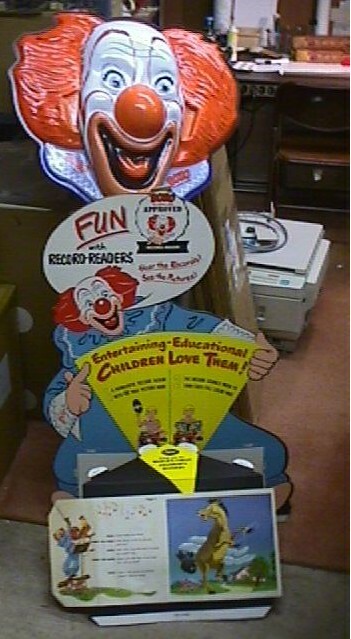 The Bozo the clown mechanical store display for Capital Records via Childhood-Memorabilia-Vintage-Items.